The Witcher 3’s tremendous, detailed open world is the main thing that sets it apart from its predecessors, but such a beautiful set of locations would be nothing if they weren’t filled with interesting quests and characters. Those quests are the subject of part four of Noclip’s excellent series of Witcher documentaries, and the new episode is filled with interesting insight. For even more great quests, check out the best RPGs on PC. It’s also naturally filled with spoilers, so bear that in mind. One quest late in the main story sees Geralt hopping across dimensions through a variety of worlds. It turns out that each of these worlds were intended to be a new quest hub with all sorts of individual stories to pursue. These hit the cutting room floor for two reasons. First, the quest team was having no end of trouble figuring out how to handle denizens of alternate dimensions. Make them too straightforward and there’s suddenly no point to calling it a strange new world. Too weird, and there’s nothing for the player to latch onto. Perhaps the most interesting bit is how the Bloody Baron quest came to be. 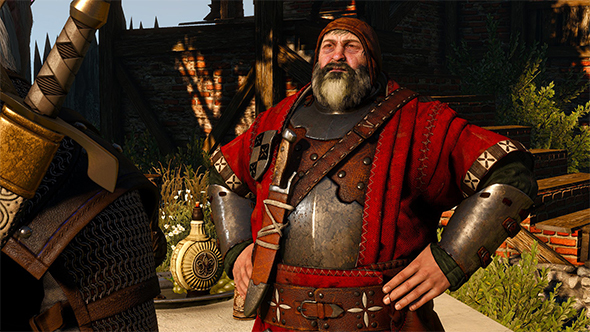 Originally, it was a far simpler tale about the general and his soldiers claiming nearby lands, and the Baron’s strained family relationship was a more of a throwaway foil for Geralt’s quest to find his own foster daughter. It was only through the writing process that the team realized they had a far more interesting story to tell in the Baron’s alcoholism and abusiveness, though obviously a far more difficult one. Dialog got rewritten even during voiceover sessions to ensure the very serious topics broached would be handled sensitively – and with plenty of emotional punch. Also, you know the traveling merchant? Maybe you don’t remember him, since he’s pretty innocuous, except for the fact that his code features a huge array of bug fixes from quests all over the game. Since his appearance isn’t affected by the state of the main story or any side quests, he was a convenient pack mule for all sorts of little fixes from across the game. There’s far, far more in the full video, and the whole series is worth your time. Previous episodes have shown how CD Projekt got its start in Polish piracy, and how Witcher 3 at one point featured a snowboarding Geralt. Two more episodes in the six-part series are yet to come, releasing on Wednesday and Friday of this week.